Due to my dear son getting a vehicle TOWED I haven’t drove a car in 50 days. Looking back on the 50 days is rough. I had insomnia, started drinking and thought I could seriously DIE. I’m 56 and have been driving every day of my life for 40 years! Depending on someone to give you a “lift” is definitely a “downer”. I seriously had the thought – “I’m never going to drive a car again. I’ll have to learn to take the bus, I’m joining AARP and going to like it (no matter what)”. WHY we have two vehicles with stick shifts, I don’t know. Why I can’t get off my f… lazy a… and learn how to drive a stick shift, I don’t know. While we’re on a red roll, what about this Vintage Purse made in British Columbia. It’s a kind-of a Vintage Trailer-Trash piece. Plastickey coated, some kind-of wickery something, that’s RED. Spent $12.00. There’s more but I’m done. Moving on . Meatball Subs and Mickey’s. One more day until my daughter and grand daughter move out. SAD but GLORIOUS! 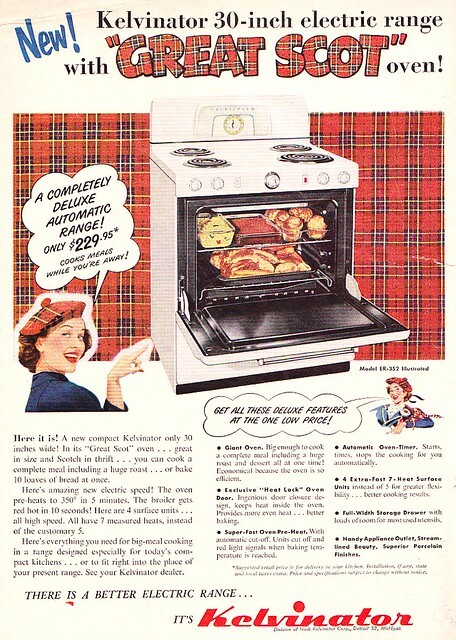 Jim emailed me last week about finding out some information on his 1950’s 30″ Kelvinator electric stove. (The 30″ standard size vintage stoves aren’t as easy to come by as the larger stoves of era). It’s up for sale for $500.00 in Denver, Colorado. Jim says, “It was purchased new in the 1950’s and put in service. The original owner sold the house including appliances to a single woman in the mid 1960’s. This vintage range is in fantastic condition and has been working for all these years. It has the broiler in the oven and a utility drawer on the bottom. I like it because it has the extra work space in the middle and is a simple, classic style which is easy to maintain. You can contact Jim at jrpeay@vantageco.net or me at antiquevintage forum@gmail.com for more information. As we struggle through hard economic times, let’s not forget ….some haunting photo’s from The Library of Congress. OK people! I’m done with blogging about Vintage White Kitchens (for a bit). Let’s move on to some vintage appliance stuff. Today on ebay I found a great resource for vintage appliance parts, 54monroe. First I looked at his feedback – looked great. Then I browsed his inventory. Good selection of knobs, grates, griddles, switches and controls clocks and more. The more, might be this 1950’s O’Keefe and Merritt for $249.00 Buy It Now. Lovin that yellow. Lovin that price. I am in the Los Angeles area and have been selling appliance parts for 35 years and collecting stoves since 1990. I have about 30 gas stoves. I have been on eBay about 3 years. I have not been parting out my collection to auction off in pieces…all the items I have are on the shelf. I have mostly O’Keefe & Merritt, Wedgewood, Chambers, Magic Chef and Tappan on the gas ranges. Frigidaire, GE, Tappan and Thermador on the electric. Steve also sent me a picture of one of my favorites. A 1939 6301 Magic Chef. It is a to-die-for stove. 8 burners, multiple ovens and that sweet bread warming cubby at the top. Glad I found him. I know everyone is always looking for those “hard-to-find” parts. Here’s a picture one of Steve’s other stove, an O’Keefe and Merritt. It’s a beauty.